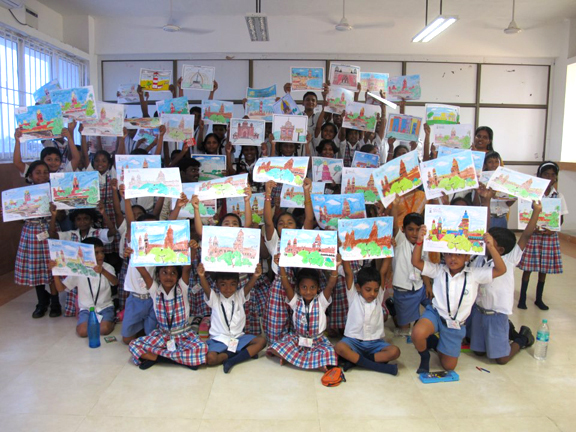 Children from Jagannath Vidyalaya, Kelambakkam, displaying their paintings at the art contest held as part of Madras Week celebrations. Yet another edition of Madras Week has come and gone. We have had the usual chorus of hallelujahs and also an equal number of naysayers who have been predicting for the past 14 years, ever since Madras Week began, that it is all a flash in the pan that will soon peter out. But the strangest of the lot are the ones that keep harping that the events are all a celebration of the colonial period of Madras. Let us do a quick analysis. Take for instance the eight Madras Musings lecture series that this magazine hosted in collaboration with several hotels, a service apartment chain and a couple of boutique restaurants. We had one programme on contemporary miniatures of heritage buildings in the city, a celebration of the Gaana- the music of North Chennai, a golden jubilee of a hotel that was built AFTER independence, a programme on Hindi films made in Madras (post 1947), the story of a Dubash’s will that funds education here and now in Tamil Nadu, the tale of how a bunch of slum children were taken by a city-based NGO earlier this year to Washington DC to participate in a festival of choral music, a talk on the bronzes and other pre-British era masterpieces at the Madras Museum, and a chronicle of how a nature-loving couple bought a farm outside the city and converted it into a forest. Where among these are we celebrating the colonial rulers? There were some heritage walks that were admittedly focused on relics of the colonial era – Fort St George was one, the Nawabi trail was another, you could include a tour of the Theosophical Society as a third. But let us not forget that the Fort is now the seat of our administration, the Nawabs were here before the British and the Theosophists continue practising their faith. How would you classify walks focusing on temples of Velachery, the heritage of our harbour, or tracing the origins of the Dravidian movement? How should we define talks on lesser-known temples of Chennai or a revival of games people played by taking them to Metro Stations and other public areas? The next set of whiners have problems with the date for Madras Day and its nomenclature. Madras is much older than August 22, 1639 they say. Nobody has any arguments with that. The city is made of various parts that go much beyond that date. But do we ask for any historical basis for celebrating Mother’s Day, Father’s Day or for that matter Friendship Day? Social Media is full of Days like that. Those who question Madras Day do not appear to have any problem with those other Days. As for the name, it really makes no difference. Let it be Chennai Day. But let us celebrate the city. It has been our home. It has ranked in the top 52 destinations of the world to travel to. It has a UNESCO Creative City tag. It tops the tourism footfalls in the country and it makes more vehicles than Detroit. If these are not celebration-worthy features, then what else would be? Let’s face it – Madras Week is a celebration of the city. Rather than finding ways and means of criticising it and predicting its demise, it is high time people responded to it positively. It is a day/week/fortnight/month when positive energy is spread. There is no politics in it and money/commerce does not play any role. In short it is a sure formula for increasing everyone’s happiness quotient. So let us continue celebrating our Madras, our Chennai, our city, year after year.